I-Hsin Venus is another of the really pretty phals from the 2015 show. 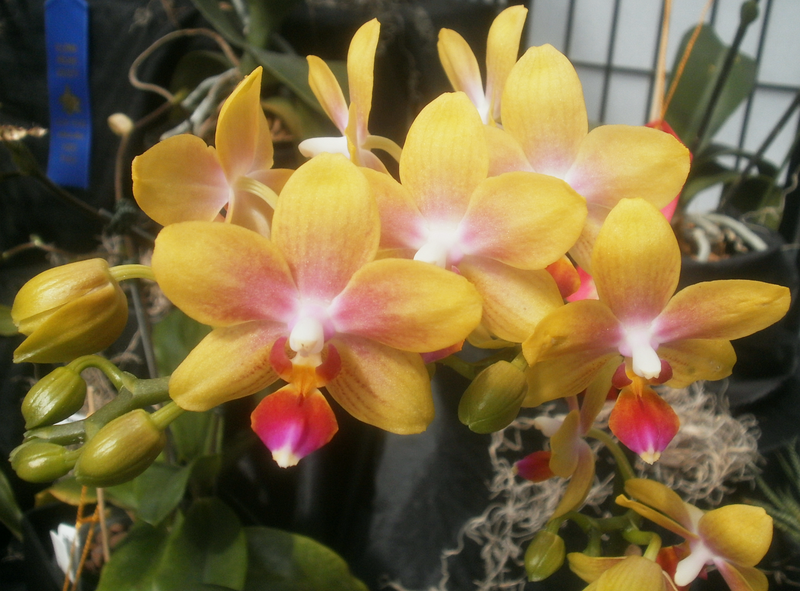 I got curious about all the "I-Hsin" phals (I've only blogged about our good friend I-Hsin Balloon and I-Hsin Black Jack, but the International Orchid Register site lists another 380 Phalaenopsis hybrids, from I-Hsin Abby to I-Hsin Zoo. The registrant name for some of these, including I-Hsin Venus, is "I-Hsin Biotech," and for the others it's "W. C. Chien." As best as I can determine from their website, I-Hsin Biotech started out as one guy doing some amateur Phalaenopsis breeding in Taiwan and has turned into an international family-owned phal-production juggernaut, with facilities in Taiwan and the U.S.
And I-Hsin turns out not even to be unusual, in the Phalaenopsis world. There's another company whose phals show up frequently at the orchid show, OX Orchid Farm,3 who are also based in Taiwan and the U.S. No doubt if I looked long enough, I could find half a dozen more enormous Taiwanese Phalaenopsis companies. I'm not crazy about the implication. I mean, in theory, there's still nothing stopping an amateur from catching a lucky break and producing an amazing seedling on their own, using a flasking service or whatever. But if you had your own amazing registered hybrid, really all you could do with it would be to sell it to one of the big companies, right? I mean, you can't really do tissue-culture at home,4 and if you can't mass-produce your plants, you can't mass-sell them either. Not sure there's anything to be done about this really. Capitalism's gonna capital. But I don't like it. Even if it does result in some pretty amazing plants. 1 I mean, not that some of my Anthurium seedlings aren't still cool. They're just maybe not this cool. 2 I have approximately 120 square feet (11 m2) of shelf space devoted to Anthuriums at the moment, including seedlings, parent plants, and germination containers. The Schlumbergeras get about 54 square feet (5 m2). 4 Technically, I think artisanal tissue culture is possible, and something people have done before, but because of the need for incredibly sterile facilities, equipment, and culture medium, one would need to be very lucky, skilled, or persistent. And a 70,000 m2 greenhouse for growing out the plants after they're created would help too. Yeah, if you're just growing them at home, there's probably not much chance of commercial success. There is something very similar happening in Taiwan with fancy betta fish breeding- a number of large-ish producers flooding US market with product. What can you do... it is cheaper to breed/produce stuff abroad. Oh, all the things we could do if we had a greenhouse and early retirement! I have one of I-Hsins too: Phal. I-Hsin George. It smells incredible.